Orders with ground shipping will ship in 1-2 business days. Air orders placed by 1:00 central time will ship same day. And although we'll try, items that are ordered together may not ship together. During checkout, setup an online account, and you can check the status of your order by logging in and clicking "My Account." (If you checkout as a "guest," you won't be able to check your account online.) Or, you can simply email Customer Service or call 888-455-2253. Sure! Just call our friendly customer service team at 888-455-2253. They're here weekdays from 7:00 to 5:00 Central Time. At this time we are only able to ship to a limited number of countries outside of the U.S. — Australia, Canada, Japan and New Zealand. Canceling an order, correcting an address or changing items are time-sensitive issues, and depending on where your order is in processing, may or may not be possible. If you'd like to inquire about canceling or changing an order, please call us at 888-455-2253 for more timely service than we can give via email. We're here from 7:00 to 5:00 central time, Monday-Friday. I’M GIVING A GIFT AND DON’T KNOW THE RECIPIENT’S CAP SIZE. WHAT SHOULD I DO? Gift certificates always fit! See them here. Or, take the guesswork out by giving a Can Wrap, Outsider Bandana, Summit Scarf or other non-sized item. I RECEIVED A GIFT BUT I DON’T HAVE THE PACKING LIST. CAN I EXCHANGE IT? I RECEIVED MY ORDER BUT IT DOESN’T FIT. HOW DO I EXCHANGE IT? We can only exchange items that were purchased directly from Stormy Kromer. If your item was purchased at one of our dealers, please contact them for an exchange. We can only return items that were purchased directly from Stormy Kromer. If your item was purchased at one of our dealers, please contact them to return your item. HOW CAN I CHECK ON THE STATUS OF MY EXCHANGE OR RETURN? For exchange or return status, please contact Customer Service by email or phone, 888-455-2253. WHERE ARE STORMY KROMER PRODUCTS MADE? Now it might be cheaper to sew Stormy Kromer products overseas, but it just wouldn’t feel right. Instead, we bring in the best fabrics on earth and put them in the most talented hands in America. All our products are proudly manufactured in the Midwest - either at our home facility in Ironwood, Michigan, a secondary facility in central Wisconsin, or with contract partners across the country. We're especially proud of our partnership with St. Luke's N.E.W. Life Center in Flint, MI. To see how a hat comes together, check out our factory tour video or visit us for our free factory tour Monday-Friday at 1:30 pm central time. You might not need instructions to wear your Stormy Kromer masterpiece, but there is a right way and a wrong way. The right way involves putting the cap on your head, grabbing the earband on both sides and pulling down. There’s no unfolding or flipping of the flaps, and you don’t have to take the hat off to use them. Just pull down and settle in. They’ll stay in place without pinching. 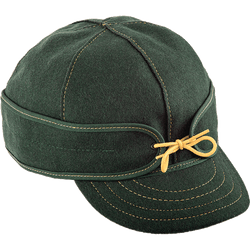 HOW SHOULD I CLEAN MY WOOL STORMY KROMER CAP? We don’t mean to get all fancy on you, but wool is dry-clean only. You’re a person of discriminating taste (otherwise you wouldn’t have picked up a stylish Stormy Kromer cap), so when you buy wool, you know that means special care. If you wash your cap or wool garments – even by hand – they will shrink or become misshapen. And machine washing, well, that’s just plain out of the question. 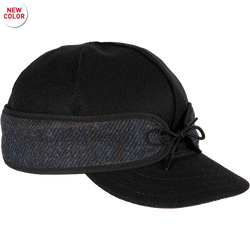 WHAT SHOULD I DO IF MY WOOL STORMY KROMER CAP GETS WET? Did you know that wool can absorb 30% of its weight in water? Our caps take on a lot of water before they feel damp. If it should happen to get soaked in the rain, just set it down out of direct sunlight and away from a heat source and it will dry out just fine. WHAT ABOUT OTHER STORMY KROMER PRODUCTS? Because many of our products contain wool, they are often dry clean only. Each product is different though, so be sure to check the care instructions for each and every product. Or contact our Customer Service team by email or phone at 888-455-2253. WHAT ARE MY OPTIONS WHEN IT COMES TO SHIPPING/RATES? Standard shipping is free for domestic orders over $75. Next-Day and 2nd-Day Air are available through UPS for an additional charge. Delivery excludes weekends and holidays. Any order shipped to a destination outside of the United States may be subject to import taxes and/or duties. As the recipient, you are the importer and must comply with all applicable laws and regulations, and are responsible for these fees. Stormy Kromer charges only the merchandise and shipping charges to your credit card. Import taxes and duties are collected by the international carrier upon delivery. Orders with ground shipping will ship in 1-2 days. Air orders placed by 1:00 central time will ship same day. And although we'll try, items that are ordered together may not ship together. Absolutely. PO Box orders are shipped by USPS. WHY DO YOU SELL SIZED CAPS? Our six-panel construction paired with our custom sizes gives you a fit like no other. No adjustable straps, snaps or buckles, just pure, head-protecting comfort. HOW DO I FIGURE OUT MY CAP SIZE? To get your size, measure around your head in the spot where a cap would rest with a soft tape measure. Take that number in inches and divide by 3.14 (pi). Round up to the nearest eighth to get your size. See the chart below for size conversions. For even more help, check out this video. Stormy Kromer caps are designed to be snug. This was, after all, one of George and Ida's initial design goals - to design a cap that stays put when the winter wind blows. Your cap stays put and the pulldown earband does its best work with a snugger fit. If that's an issue for you, you may want to consider going up a size. Print out our sizing tape, click here. DOES MY CAP HAVE A GUARANTEE? The Stormy Kromer Lifetime Guarantee program started in 2010, when we began sewing a unique serial number into each cap. 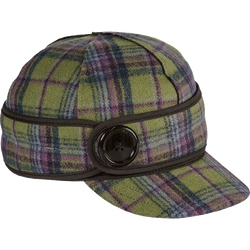 If you purchased a Stormy Kromer cap with a serial number and it wears out due to poor workmanship, faulty material, or production defects, we'll replace it free of charge. For all the details, including how to start the process of getting your new cap, click here. WHAT IS THE STORMY KROMER INSURANCE POLICY? Your new cap comes with more than a comfortable fit and rugged good looks, it also features a little protection for your peace of mind. Register your Stormy Kromer cap with its unique serial number found on the white label inside your cap. If it is lost, stolen or destroyed within three years of the date of purchase, we will replace it at 50% of the current catalog price, plus applicable shipping and taxes. No questions asked. (Limited edition caps are, well, limited, so there aren't necessarily any available for replacement. We're awfully sorry abou tthat. When redeeming your policy on limited edition caps, you may choose a cap of similar value.) To put this free insurance policy into effect, register online or mail in the form attached to your cap's hangtag. To use your insurance policy, call our Customer Service team at 888-455-2253. This policy is limited to a one-time replacement.